Aqua/Water, Glycerin, Acrylate/C10-30, Alkyl Acrylate Crosspolymer, Dicoccodimonium Chloride, Steartimonium Bromide, Isopropyl Alcohol, Phenoxyethanol, Oryza Sativa (Rice) Bran Extract, Algae Extract, Butylene Glycol. Rice extract: natural source of some antioxidants, which are Tokoferol, Tocotrienols, Gamma Oryzanol, Phytosterols, Polifenol, and Squalene. Resists free radicals and helps slowing down aging process. Algae extract: absorbing minerals and sea salt, algae is believed to have natural healing characteristics which is also able to slow down the aging process. Moreover, the minerals in algae are also able to restore skin's natural moisture. V10 Plus Water Based Peeling contains rice and algae extracts. 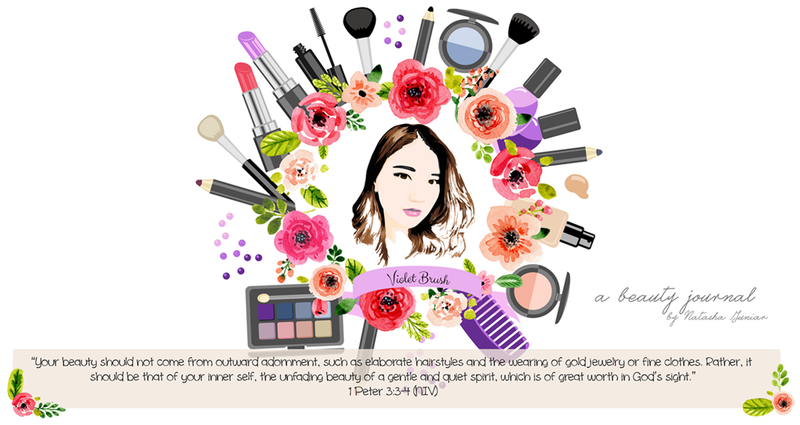 Without rough scrub, V10 Plus Water Based Peeling is able to exfoliate dead skin cells, clean and brighten up your skin instantly. 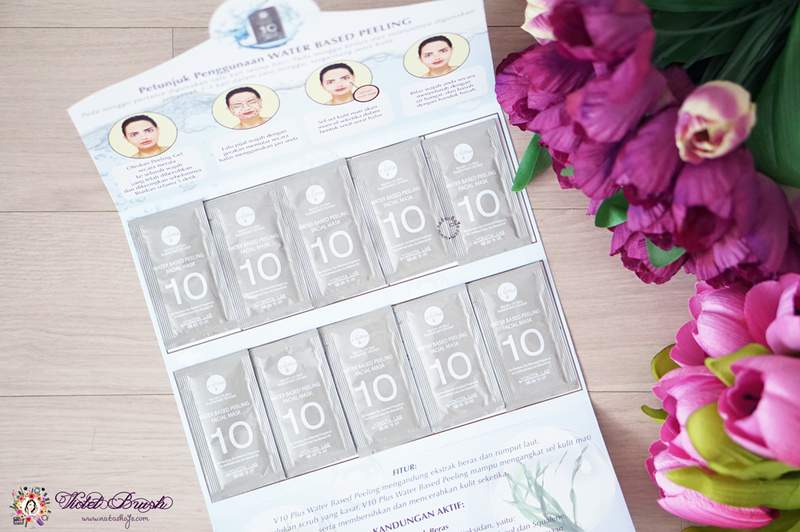 The only thing that changed from V10 Plus Water Based Peeling Facial Mask is the packaging, it's half in size compared to the previous one and more compact. There is no change in the formula, though. It's still sold in a package of 10 sachets, 2ml each. I really love how they sell this in sachets because it's very convenient to take this during vacations without having to worry of leakage. It's also more hygienic compared to bottled pacakging. 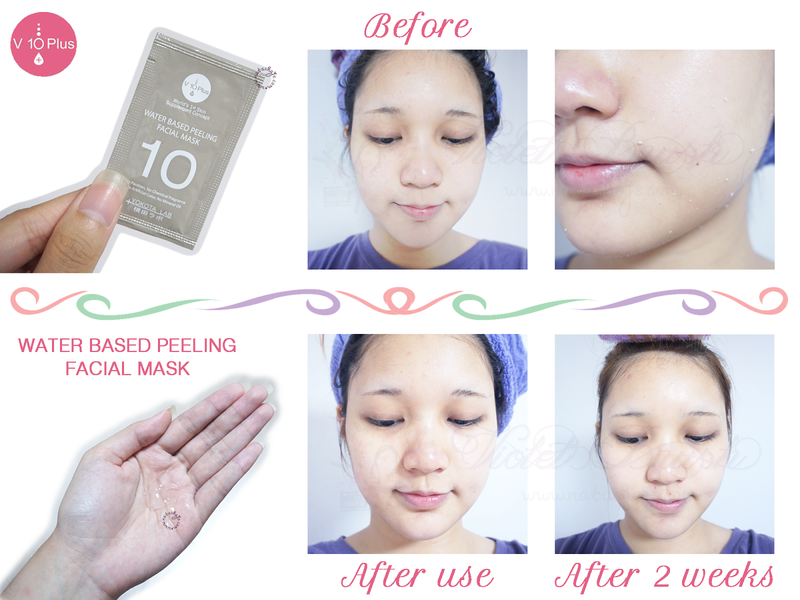 V10 Plus Water Based Peeling Facial Mask has a form of clear gel which turns into liquid/water upon contact with the skin. It's very watery and is very gentle on the skin. However, it smells kinda like medicine but not as bad as the Serums series. I used up about six sachets of V10 Plus Water Based Peeling Facial Mask in two weeks. Upon first use, I only noticed that my skin was very soft and smooth like baby skin. My skin was also a little bit brighter. That was all. But after two weeks, I noticed that my blackheads were softer and fairly easier to extract. The acne I got before disappeared pretty quick but I did got some other acne, perhaps due to "the time of the month". Overall, I still love this V10 Plus Water Based Peeling Facial Mask very much. Well, who doesn't love soft and smooth baby skin, right?